Many refrigerants mixture or mixtures of two or more of the individual substances. Mixtures can be azeotropes, near azeotropes or zeotropes. Azeotropes exhibit a boil, strictly speaking, in a certain pressure, but, nevertheless, they can be considered as a single substance. The first azeotropic refrigerant was CFCs, R502, so the use of refrigerant blends, is not new. Where boiling temperature changes over the constant pressure process of preparation of various temperatures of evaporation and condensation exist in the stage of the change process. R407C is the most widely used zeotrope. 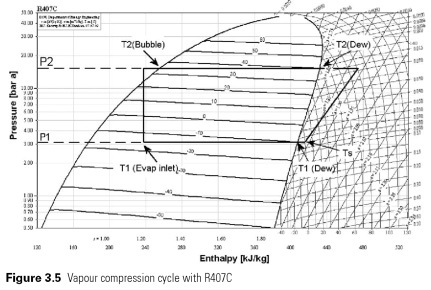 Referring to Figure 3.5, in the form known vaporous compression cycle do not change, as shown. Permanent P1, steaming and P2 condensing pressure processes are presented horizontal lines and lines of constant temperature now sloping. The temperature at which condensation begins is called the dew point, denoted here as T2(Dew). As condensation progresses, the temperature falls to T2(Bubble), so dew-point temperature T2 40C corresponds to the boiling point, temperature of about 34C. the temperature in the process of evaporation changes from T1 (Evaporator) T1 (Dew), as lighter components of the mixture, R32 and R125, evaporate preferably on R134a and remaining liquid becomes R134a rich, its boiling point, gradually increasing until all the liquid has evaporated. Please note that this does not mean that lighter components boil away leaving fluid R134a at the end of the process. The composition of the shift in the process is limited and quite small. Further overheating then happens after complete evaporation, the increase of temperature Ts is the temperature of the suction in the compressor. РћР±РѕСЂСѓРґРѕРІР°РЅРёРµ always should be charged from the liquid phase, or the concentration of the components will be incorrect. Ingress of air should be avoided. Mixtures which have a large temperature glide, more than in 5 (K)shall not be applied for the flooded evaporators type.